My second (or is it third – who’s counting?) 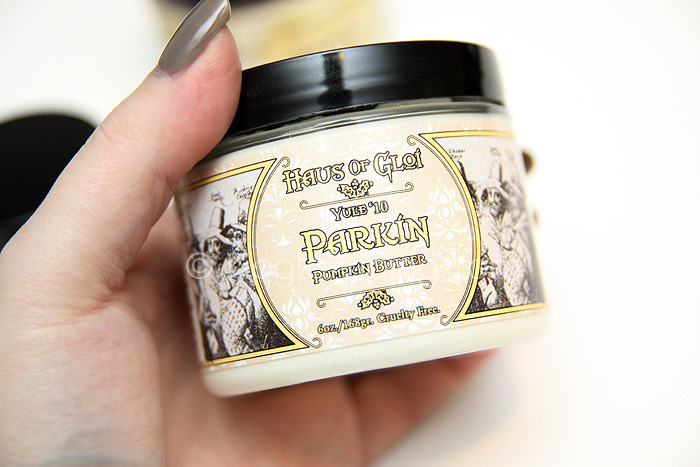 Haus of Gloi order arrived a couple of weeks ago and included the limited edition scent Parkin and Aduwa from the permanent line. I think by now, it’s confirmed that I’m a lover of the gourmand, foodie smells – particularly from this brand. They simply do them so well. I’ve already talked about Pumpkin Queen and I won’t spend long on Saft Ernte (seeing as it’s barely available on site anymore) but suffice to say that if you’re a fan of Pumpkin Queen, you’ll like Saft Ernte too…. it’s a slightly peachier, sweeter version of Pumpkin Queen. It’s a teeny bit *too* sweet for me… but not by much. Parkin is still extremely gourmand… albeit darker. In the jar, it’s all about the gingerbread… but once on the skin, it has a bitterness that comes from the black treacle. The scent doesn’t last quite as long on me as Pumpkin Queen does but the formula is just as rich, moisturising and moreish. 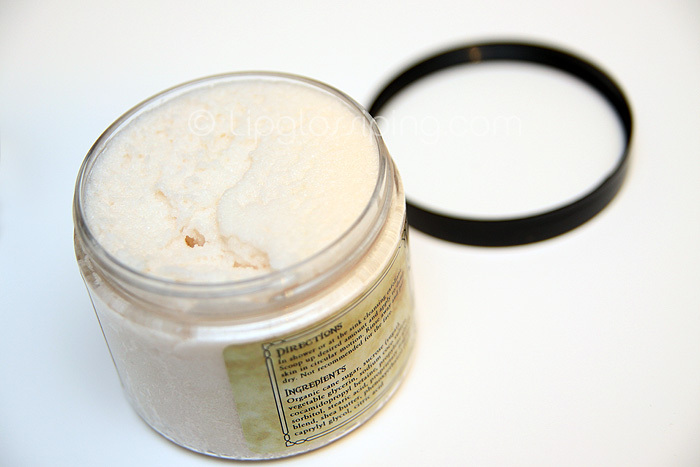 Aduwa is part of the permanent line; described as: Sweet, hot, creamed ginger over a thick benzoin, creamy coconut milk. 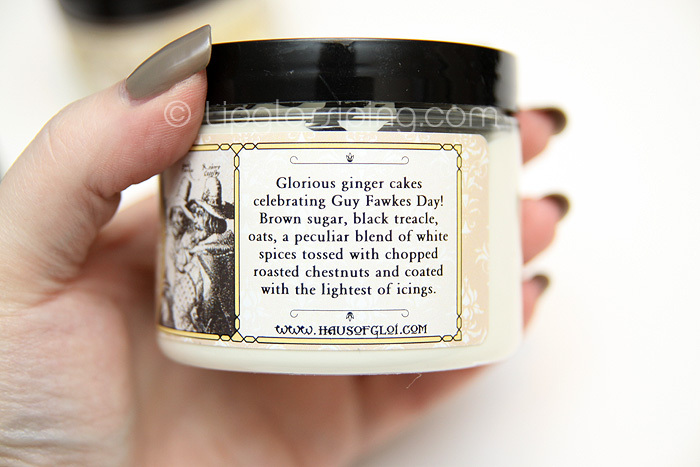 I’ve only smelt this in the jar as I’m still finishing up my mini size Samhain scrub… but first impressions tell me that Aduwa smells good enough to eat! The coconut is strong and true… none of this synthetic sun tan lotion coconut scent. It’s like sticking your snout in a bag of dessicated coconut. The next thing to come through is the creaminess… I was expecting a hit of ginger but it’s lacking a little. This is pure coconut mixed through creamy hot milk. Delightful. My addiction to all things Haus of Gloi is well and truly compounded. My Yule Tide order came through a couple of days ago… but I’m not even allowing myself a sniff until I’ve made some head way into these items. I’m sure that won’t be too hard a task for me to manage! 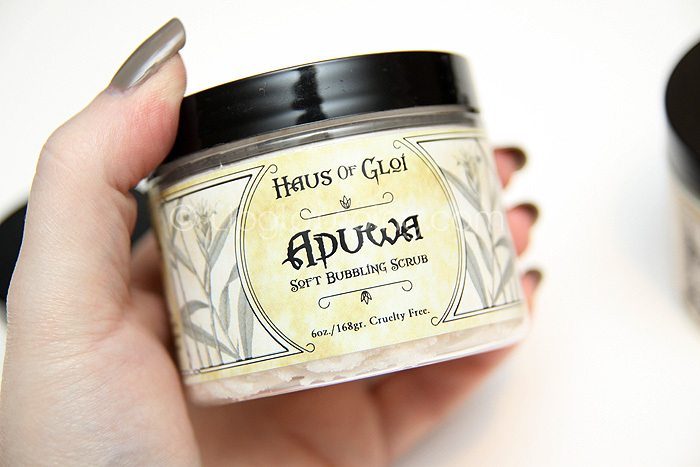 Have you ordered anything from Haus of Gloi yet? I got hex and saft ernate pumpkin butters, they are so nice I thought saft ernate was too sweet but I love it on, nice for winter. I got satyr and parkin in scrubs, love them both, satyr is such a nice orange-y smell. Now waiting on my second order. LOOOOOOVE Haus of Gloi. I have SO many of their products. Aduwa is a favorite of mine, I even requested to get the perfume oil despite the fact that they don’t normally offer it–it’s one of their less popular fragrances but I ADORE it. When you use the scrub, the ginger will come out! It’s lovely and spicy and warm. Man, talking about it makes me want to wear it! I think that’ll be my perfume for the day. We recently ordered some of their Yule scents, and while I enjoyed Snow Wolf and Eggnoggin, Hearth reeked of those nasty, cheap hazelnut-scented candles one finds in craft shops. Disappointing compared to their usual offerings! The Aduwa used to have a lovely layer of coffee beans which added a nice scent; it looks like they’re changed it, which means the spouse will be very unhappy indeed. It was his favourite! I haven’t tried the Aduwa on the skin yet… I wonder if the coffee scent comes out when it warms up on the skin. I find Parkin different in jar to on skin. I’ll update here if I can smell coffee! Just when I thought I could put my HoG lemmings aside, your post pops up! Ah, I ‘ve checked the site a couple of times, wouldn’t know where to start from! Lol! Hmm i’ve been really tempted to order from here lately. Do you have to pay customs charges when the items are delivered though? Got stung on that before, cost me twice the postage I had already paid on it, not sure I would want to add the extra cost on again. As long as you keep your order total to under £17 (around $27) you’re immune ffrom customs duty. Oh, I’ve actually been looking for some new butters! I’ll give this brand a go, I must say I can’t resist the adorable label design! Also, the fact that they are vegan seals the deal! Thanks for sharing your experiences with these products. 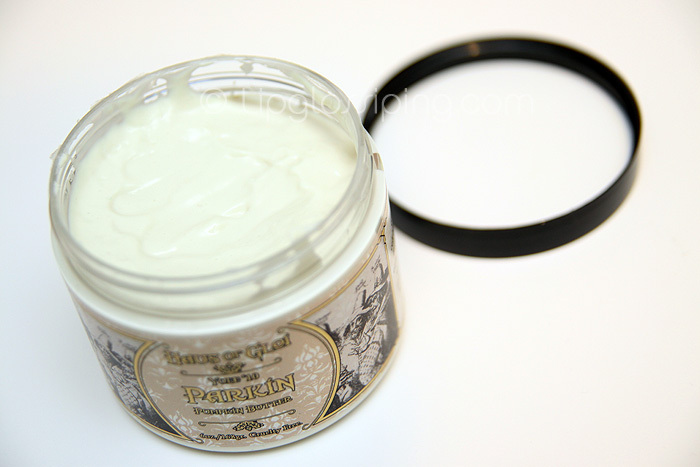 I just made my first order today — Picarune, Apothecary samples, the Yuletide scent sampler and a few other things.